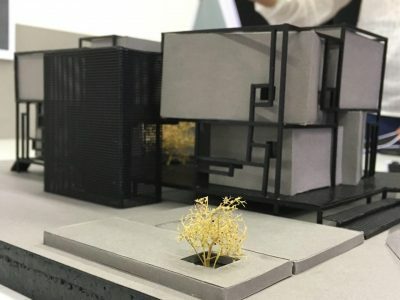 This is the model of an exhibition house in Amsterdam. We designed it for a specific collection of De Stijl Art pieces. As we went through this subject, we noticed a quality of framelessness in the works of Mondrian. Talking about what is a “frame” and how it can be defined, we tried to reach a concept by defining the opposing elements. We decided to have illusive frames, to define -for example- a door which is not a real door or to break the frames in order to release the masses. In this design, the lines of the paintings have been translated as the linear structural elements, and the masses represent the plastic and emphasized presence of colors. As we researched in the ideas of “De Stijl” we found the close relation between the natural elements such as a tree and the subjects of these paintings. We have used this idea by centrifuging the masses from the first floor (which is the exhibition space) towards the ground floor (which is more public and service spaces). Also, we used the metaphorical tree in the center of the project to have the continuous view from the mass towards it and to show this connection between “de Stijl” and “Nature” in realty and in metaphor.